Once again, Iron Maiden is touring the world aboard a Boeing 747 jumbo jet endearingly dubbed Ed Force One. Its namesake is derived from U.S. presidential plane Air Force One and the band's recurrent skeleton mascot, Eddie. 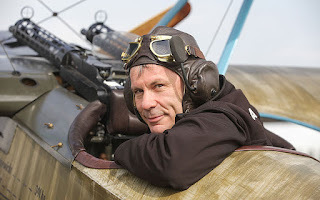 Piloting the plane for the entirety of their tour, and not for the first time either, is Captain Bruce Dickinson, lead singer for Iron Maiden. Iconic at least, legendary at best, the British heavy-metal band has found continued success in over four decades of songwriting and performing. As we draw towards the end of their "Book of Souls World Tour," the official website cautions that "many of the shows are already sold out, particularly in North America." The tour is set to reach as many as 35-cities by its end in August. Dickinson commanded a modified Boeing 757 for the "Somewhere Back in Time World Tour" in 2008 and the "Final Frontier World Tour" in 2011. Since then, the immutable force of creativity and timelessness known as Iron Maiden have been upgraded to the newer Boeing 747, forcing Dickinson to undergo a type conversion or rating in order to be allowed in the skies. Specially modified to lug the band, crew, and 55 tons of equipment, the chartered Boeing 747-400 jumbo jet is decked out with Iron Maiden swag galore from artwork on the fuselage to custom items lining the interior. In the above video, courtesy of Boeing, Dickinson can be seen touting the merits of the 747 amidst a swath of yellow-vested employees. In an exclusive with Adweek, Boeing spokesperson Mary K. Kelly said, "When Iron Maiden announced they were using a 747 for their world tour, we knew we wanted to work with them to 'bring the plane home' - to Boeing, where it was built." And the band complied. Making the journey from nearby Vancouver to Tacoma, Washington meant that Dickinson was able to tour the Boeing factory and interact with something like 3,000 fans ... er ... employees. 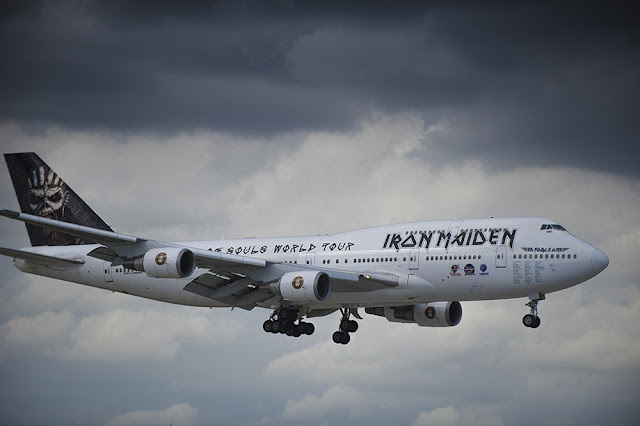 The only word to describe this venture into the skies, complete with the band's entire show, including personnel and equipment, is rare, undone until Iron Maiden took on the challenge. People have recognized this in more ways than one, including a comprehensive article detailing one man's experience touring with the band. Some comparison was likely to happen, but who would have thought that the internet would seek to emasculate by sizing up the Ed Force One next to the private planes of Germany's chancellor and the president of France? It was in Florida in the early 1990's that Bruce Dickinson first earned a commercial pilot's licence. Before his induction into metal, Dickinson flew Boeing 757's for U.K. charter airline Astraeus, and contributed to marketing for the airline until its closure in 2011. Despite his status as an international figure, Dickinson never gave up flying, whether jumbo jets or biplanes. Thanks to his prestigious career in flying and knack for melting faces, flights piloted by Dickinson had a certain quality about them; he created unique in-flight experiences for the likes of RAF pilots, football clubs, and stranded travelers.